Thousands of of people have signed a petition against Scots athletes wearing the official Team Scotland Commonwealth Games outfit. The clothing has split opinion, with athletes and organisers said to have given a “favourable reaction” but many people continue to ridicule the outfits on social media. 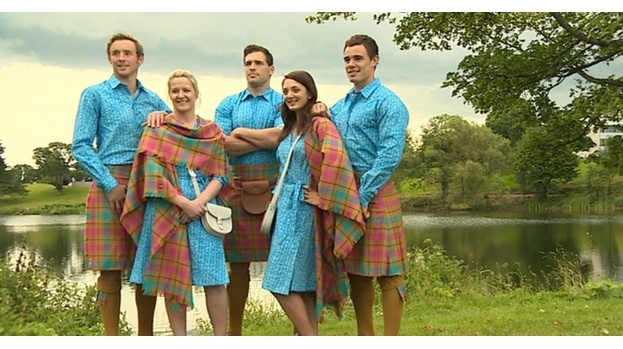 Team Scotland describes the male uniform as a “turquoise, fuchsia, navy blue and caramel” tartan kilt with a blue shirt, while the women will wear a “flowing wrap-around dress”, said to be inspired by the Saltire flag. A shawl-like wrap and a stone-coloured leather bag complete the women’s uniform. Textile designer and artist Jilli Blackwood, who created the outfits, even said she “didn’t expect everyone to like them”. Now, more than 2200 Scots have signed an online petition entitled Prevent the Use of the Jilli Blackwood Scotland Uniforms. The author of the petition, Richard Brown, wrote: “The uniforms being used are truly horrendous. “Please step in and prevent them being used while there’s still time for an emergency Plan B – before our poor, brave-faced athletes are subjected to parading around in them. One of the people who signed the petition, Ross Laidlaw, wrote: “These ‘costumes’ are wrong in so many different ways. Apart from the fact they look terrible and are an embarrassment for the people who have to wear them and the people of Scotland they also bring into question the credibility of the people who allowed them. More like a “gay day”. No offence to to Gays. My perception as a Scotsman is, the outfit for the men is effeminate. I am thinking Guinness Book of Records for the worst kilt in the world.